I decided this year I would only take one workshop at the Quilt Festival and did I pick the right one! It was titled Indigo Shibori Style and the instructors were Glennis Dolce (Shibori Girl) and Katrina Walker (seamstress extraordinary). Pictured on top is the front of the vest I have not as yet completed. I still need to add the side inserts and finish the edges. The front panels of the vest are all silk. 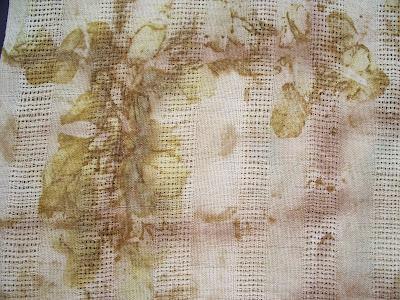 The back panels, as seen in the picture above and below, are cotton. Each of the panel sets were a different kind of silk or cotton. The panels were all prepared in Glennis’ session. The vest construction was done in Katrina’s session. I am still not overly comfortable sewing a garment but so far it is looking wearable. Workshop is highly recommended and I’ll look for these two ladies again next year. Now I can concentrate on finding supplies and looking at fantastic quilts. Each time I prepare bundles for printing I can hardly wait to see what results. Above is one of my favorites. 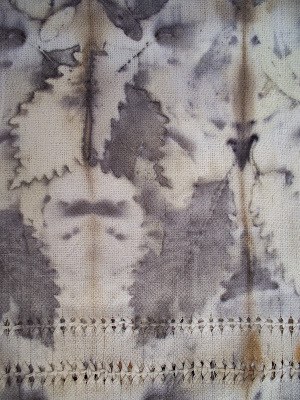 Oak leaves printed on cotton. The beautiful color is helped along by processing in a tin-lined pot. Another favorite is rose leaves. These are printed on silk with an assist from a little copper to bring out the beautiful color. Tried a new combination. 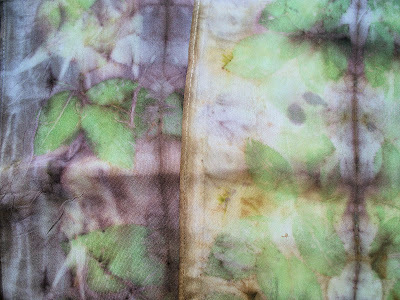 Some crape myrtle leaves on cotton with a bit of copper in the dye pot. What a lovely yellow color. Think before the leaves begin to think about falling off the tree, I may try some additional combinations with the crape leaves.